Maeve, a 17-year old girl living in Madison, Connecticut, received a very special delivery of an Autism Service Dog from Service Dogs by Warren Retrievers to help better communicate her needs on the spectrum. Madison, CT, June 12, 2018 --(PR.com)-- Maeve, a 17-year old girl living in Madison, Connecticut, received a very special delivery recently. An Autism Service Dog was delivered to Maeve from Service Dogs by Warren Retrievers to help assist her and better communicate her needs on the spectrum. Based in Madison, Virginia, Service Dogs by Warren Retrievers, or “SDWR,” has a mission to provide specially-bred and trained dogs for people with invisible disabilities like Diabetes, PTSD, Seizure Disorders, or in the case of Maeve - Autism Spectrum Disorder. SDWR has over 600 service dogs working across the US and around the globe. SDWR is currently serving approximately 1,000 families. Scott, a labrador retriever Autism Service Dog, recently graduated from SDWR’s Service Dog Raiser Program where volunteers diligently raise puppies in training for over the course of approximately one year. Both the dogs and raisers must complete the foundation and skill set training provided through SDWR trainers at their facility in Virginia. Scott is also an honored graduate of the SDWR Fallen Officer Puppy Program. The Fallen Officer Puppy Program, or “FOPP,” is an initiative by SDWR to pay respect to the legacy of service by fallen American police who sacrificed their lives in the line of duty. Scott is named in honor of fallen Special Agent Scott McGuire of the United States Department of Homeland Security Immigration and Customs Enforcement who was struck by a drunk driver in 2016. Scott’s Autism Service Dog work with Maeve will carry on in memoriam of Special Agent McGuire’s life of service before self. Maeve was diagnosed on the Autism Spectrum at 7-years-old. Maeve is a Junior in college and due to her autism she is very anxious all the time. Maeve is a high functioning autistic young adult. She attends a public high school and receives special education services. She suffers from anxiety and displays many of the typical autistic behaviors seen in children with that diagnosis such as ritualistic, repetitive behaviors and adhering closely to rules. Maeve’s family is hopeful that with the arrival of Scott it will help to give her greater sense of calm with her service dog at her side every day. In addition, it will boost her confidence and help her branch out on her own. “Dogs have always calmed her down and reduced her stress level. She will be more independent and be willing the participate in sports and activities with a service dog by her side,” says Cathy, mother of service dog recipient. Scott will assist in reducing the effects each diagnosis has on the family’s independence and daily life by working continuously with Maeve. Since Scott is a service dog and covered under laws in accordance with the Americans with Disabilities Act, he will be able to accompany Maeve and his family everywhere - like hiking, to the beach, school, and even to field hockey practice and games. This training program is what sets SDWR apart from other non-profit service dog organizations. SDWR trainers will continue to return for training sessions with Maeve, her parents, her siblings, and Scott every 3-4 months over the course of the next 18 months to continue working on Scott’s customized training, follow up training and training the human to make a successful team and public access certification. 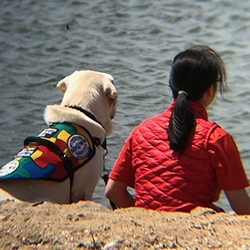 Service Dogs by Warren Retrievers is a nonprofit organization based in Madison, Virginia, and relies on donations to help the organization in its mission, “Until there’s a cure...there’s a dog.” To make or donation or learn more about SDWR, please visit the website, http://www.sdwr.org. To learn more about Autism Service Dogs go to http://www.sdwr.org/service-dogs/autism/. To find out how you can volunteer as a puppy raiser visit http://www.sdwr.org/volunteer-opportunities/.